Garages are usually not insulated as well as houses we reside in, and for that reason, they get exceptionally cold during the winter season. It is great if you can leave all your garage-related work as soon as the cold hits, and enjoy the comfort of your home while waiting for warmer days. However, if you make your living by working in your garage, you cannot afford that luxury. No matter if your garage is your workplace or you are overly enthusiastic about your garage-related projects- you should buy a garage heater if you can afford it. For this reason, we will guide you through everything you need to know before you invest in a garage heater. We have also reviewed five best garage heaters currently on the market so that you can simply choose the one that is ideal for you. Sit back and enjoy! How to Choose the Best Garage Heater? Garage heaters come in different types, heating output, and price range; choosing the best comes down to your personal needs, preferences and, of course, your budget. We have comprised a general guide to lead you through the process and inform you of all the important steps you should take before you decide and spend your hard-earned money. First of all, you need to be informed of the types of garage heaters available, understand their differences and decide which one is most suitable for you and your home or commercial garage. These heaters, as their name suggests, feature a built-in fan. They make use of electricity and transfer it into heat. More specifically the fan takes the cold air from the environment in, heat it via the heating element and then recirculate it back into space. 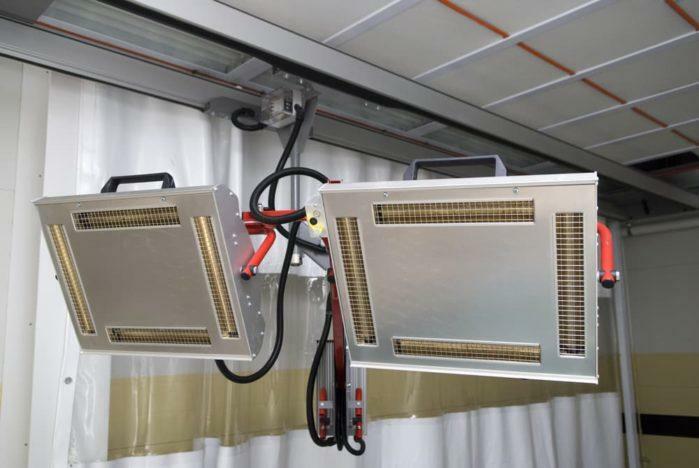 Since they are easy to install and heat the space very quickly, they are the most popular type of garage heaters. These heaters work on natural fossil fuels instead of an electrical power source or batteries. Highly effective at heating up even the large spaces, they are often used in commercial garages. As they do not require a connection to the mains, they are very portable too. Be careful though since the fumes they produce can be dangerous in small and enclosed spaces that are not properly ventilated. These heaters direct heat energy waves which are absorbed by objects around them. The process is similar to the sun heating the objects on earth. There are very silent as there is no noisy fan but, on the other hand, you have to be very close to them to feel warm. For this reason, they cannot heat large spaces and are more suitable for home garages than the commercial ones. Most of the time you can find information regarding the amount of power required to keep the heater running on its package. You should look for a﻿ BT﻿U value and a number of watts the heater can produce. The higher BTU rating or the number of watts show that more heat can be generated and larger space successfully heated. Most of the time the rating provided is not guaranteed but rather refers to the power produced in the best conditions. For this reason, we recommend that you always buy a heater a bit more powerful than you actually require. You can always set the heater to lower adjustment or simply turn it off, but if you set it to the maximum and it is still cold in your garage- your hands are tied, and you can only buy another heater. It is better to be safe than sorry as problems that lead to a loss of heat can also be numerous- such as poor insulation within your garage or draughts. In order to determine the heating power, you need to determine the size of your garage first. The size also influences the type of garage heater you are going to choose. You can use the radiant or infrared heater in smaller spaces as they do not heat the air but only objects around it, and as a result, there is not a significant heat loss from ventilation or large draughts. Fan forced heaters are also suitable for small garages you just need to buy the one with an appropriate wattage- around 1500 watts would do the job. If your garage is a large one you should purchase a heater of around 4,000 – 6,000 watts. First of all, you should check your electric bill and determine how much you pay per unit of electricity. Next, find out the input power your garage heater uses- it is expressed in kW and usually marked on the package or on the heater itself. Finally, multiply the price of your electricity per kW hour with the input power in kW, and you will have an hourly running cost of the heater. You can next multiply that number with the number of hours you use your heater during one average day and predict your daily running cost. Using the same scheme, you can go even further and calculate your monthly or even yearly expense. However, efficiency can mean different things to different people, and the best garage heaters are not only cost efficient but also in terms of ease of use, coverage, and wattage. This safety feature is especially important if you are going to operate the heater for extended periods of time as most heaters will occasionally become overheated and that represents a potential hazard. Consequently, the best garage heaters are equipped with overheat protection; it means the heater automatically turns itself off when it reaches potentially dangerous high temperatures that can lead to a fire or damage the heater. In busy, working environments such as garages, the risk that the heater will get accidentally knocked over is quite high. As a result, best garage heaters feature a tip over switch. It functions in the same way as the overheat protection- as soon as the problem occurs the heater automatically turns itself off. This safety feature is a must if you have children and pets, as they are most often not aware of the fact that they can burn themselves if they touch the surface of the heater. But even if there are only adults operating around a heater, you should avoid it becoming too hot to touch. Although it seems like a minor risk, this can lead to serious consequences, and you should always opt for a heater that incorporates this safety feature. Before you buy and install your garage heater, you have to make sure that you have the correct wiring in operation. Moreover, ensure that you are able to follow the necessary guidelines and respect all the laws defined by your local authority. If you are installing a permanent heating unit, think twice before you position it as you will not be able to change that easily. Once you are sure that you can install the unit according to all the recommendations, and that you will be able to use it safely to the best of its possibilities you can buy the unit, have it installed, and start enjoying the warmth. Fahrenheat FUH724 is a multi purpose heater that can develop up to 25,600 BTU and is perfect for larger garages. It comes with ceiling brackets which allow you to easily fix the heater to the ceiling of your garage. The heater can be adjusted for both vertical and horizontal heat flow according to your current needs; this means that you can direct the heat towards the area of your garage you are currently working in for maximum heat payoff. It is very compact, actually one of the smallest heaters with such a high wattage. It is really efficient and heats up the garage in a matter of minutes and after that maintains the temperature you have set. If it overheats, it will automatically shut off current, but also reactivate on its own when temperature returns to normal which is very convenient as most of the heaters have to be reset after they automatically turn off. The only problem, especially if your budget is tight, is the running cost. For this reason, we would recommend it to someone who will use it for a few hours at a time or as a supplemental heat source. Mr. Heater F232000 MH9BX Buddy Heater can produce up to 9,000 BTU of comfortable radiant heat and warm up a garage of up 225 square feet. It is an ideal solution if you have problems installing an electric garage heater due to a power supply or other concerns. This affordable propane heater is both outdoor and indoor approved and produces an adequate amount of heat for the average garage. As it heats only the object in its immediate proximity, it is best to position it so that you are in direct line of the heat in order to get the maximum heat payoff. Security features included are a built-in auto-shutoff system which will turn the heater off as soon as it tips over when the oxygen levels in the room drop too low, or the pilot light is extinguished. It is highly portable and features a fold-down handle that allows you to move it around and use it not only in your garage but also in your home or even outside. If you do not mind some odor and having to ventilate the garage as to avoid carbon monoxide build up, this heater might be a good and budget-friendly solution. Dimplex DGWH4031 is a 4000W garage heater which can produce up to 13,640 BTUs and heat up to 400 square feet. It will heat an average sized garage rather quickly, but unfortunately not very quietly. On the plus side, it is an extremely heavy duty, corrosion resistant, reasonably priced heater packed with beneficial features. You can position the unit on the floor or counter but mounting it on the ceiling will give you the best heat payoff as you can then target the airflow towards the area of the garage you work in.It features an automatic temperature control which maintains a consistent temperature. The temperature that you will feel most comfortable with can be set via a thermostat to any value from 45 degrees to 77 degrees Fahrenheit. The overheat protection and cool-down feature function as expected, and as a safety bonus the unit shuts off automatically if, for any reason, the airflow becomes restricted. On the downside, this heater will noticeably increase your heating bills, so be careful not to overuse it and then pay more than you intended to for the electricity it has used. Fahrenheat FUH54 Garage Heater is a 5000W garage heater that can produce up to 17,000 BTUs and successfully heat even large garages. Amidst the detailed instructions, the installation can prove to be a challenge as it is designed to be permanently installed and hardwired, not plugged in. For this reason, it is maybe best to leave the installation to an electrician, which also means an additional cost. On the plus side, the unit comes equipped with a mounting bracket to mount it on the ceiling and thanks to the rotating mount it allows for the heat to be directed wherever you need it the most.Furthermore, the air exiting the unit is not hot but rather warm and well dispersed keeping the garage and people in its proximity pleasantly warm. A thermostat which will allow you to regulate the heat output is also included with this heater and features a red light which will warn you if your unit overheats. The only complaint we have is that the thermostat has no temperature labels on it and is located on the front bottom which might be hard to reach depending on the height of your ceiling. Dura Heat DFA50Forced Air Heater is a highly portable, manually controlled heater that can produce up to 50,000 BTUs and heat an area of up to 1200 square feet quickly and effectively. It is multi-fuel capable which means it has been tested with K-1 kerosene, JP-8 and Jet-A fuels, #1 and #2 fuel oil and diesel. We recommend using it with K-1 kerosene as it produces the least odor. It can run up to 14 hours on a 5-gallon fuel tank. Other useful features incorporated into this heater are a heavy duty ignitor which allows for a one-touch electronic start, "run time" fuel gauge, overheat protection and flame-out auto shut off, which make the unit both convenient and safe to use. There is no built-in thermostat to regulate temperature, but the manufacturer offers a compatible external thermostat for an extra cost. As all forced air heaters, Dura Heat DFA50 features a rather noisy fan and requires a well-ventilated space to operate in. If you do not mind having the window or doors open for ventilation, some unpleasant fumes, and slightly larger safety risk, this heater will bring cost and energy efficient heating to your garage. It is hard to choose a winner in such a tight competition, but Fahrenheat FUH54 Garage Heater balances the price and quality the best. 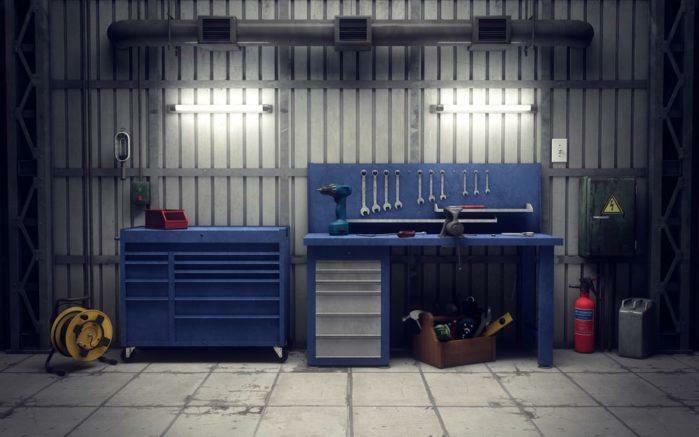 Its heat output will be enough for every garage no matter the outside temperature, and it is a reliable and durable unit that will last you many years. On the other hand, any of the reviewed garage heaters will not disappoint you and will keep you and your garage warm so do not wait until the last minute but rather buy the heater on time and be prepared for the fast-approaching cold days.